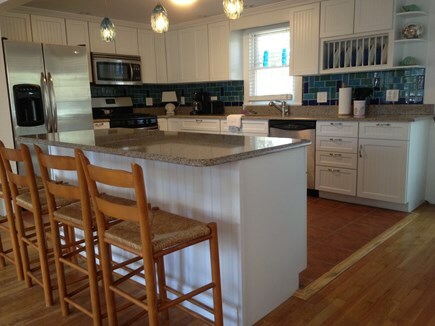 Updated kitchen with Quartz countertops and island seating. Eat in kitchen opening out to the deck. Table can be expanded. Bright and airy living room with two couches. Flat screen TV in family room with plenty of seating. Queen size bed on first floor. 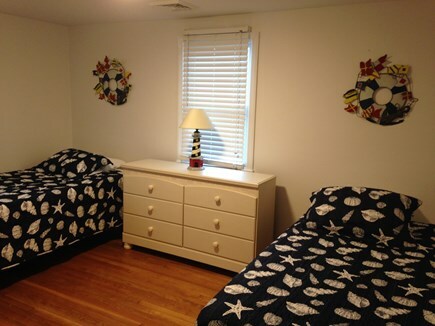 Two twin size beds in second bedroom on first floor. 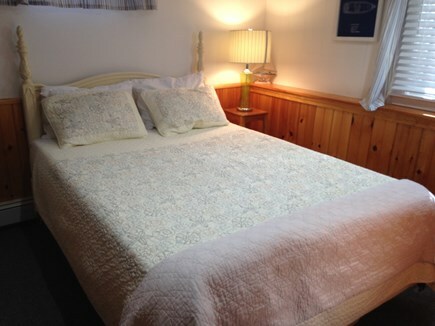 Queen size Sealy Posturepedic bed on lower level. Daybed with pull out trundle. 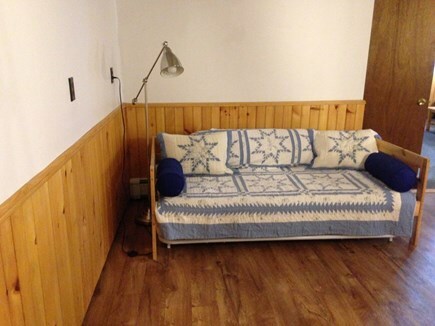 Queen size pullout sofa bed on lower floor . TV with Roku. 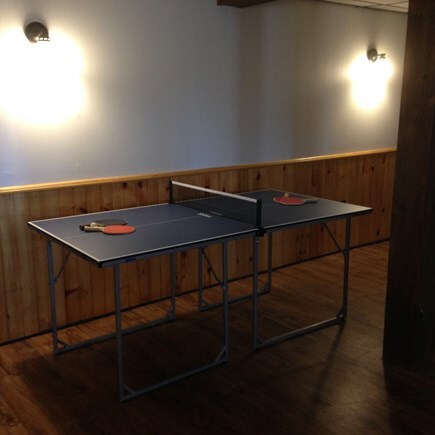 Ping Pong table on lower floor. 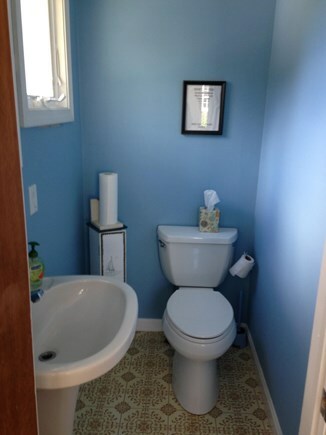 Half bath off of Family room. 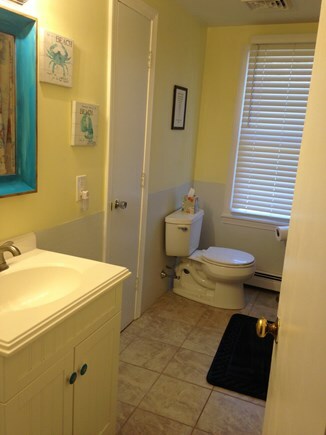 Full bath across from bedrooms. Easy to enter with one floor living. Welcome to your little piece of the Cape! 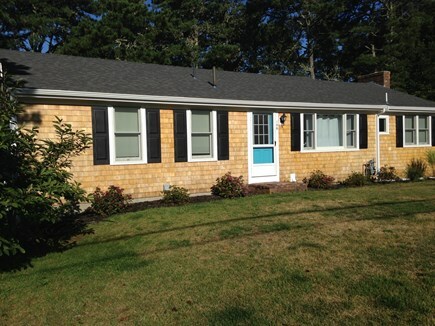 This adorable ranch is a dog-friendly home that has superb access to the Cape Cod Rail Trail bike path. 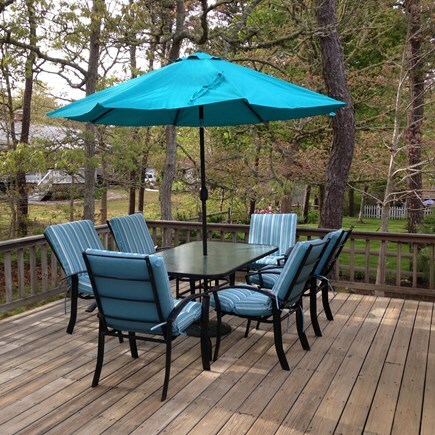 We are only minutes to Red River Beach, the Harbor in Harwich Port, and Chatham. Featuring Central Air, an updated open concept kitchen with stainless steel appliances and Quartz countertops. Includes: Pots, pans , Lobster pot/crackers, coffee pot with filters, blender, toaster, gas stove, wine & margarita glasses and a microwave. 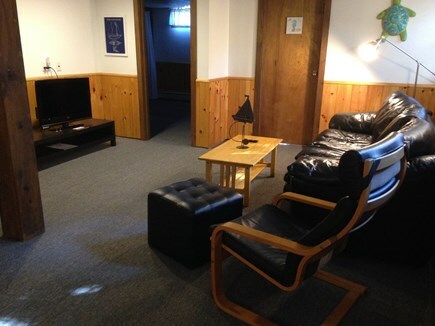 The cottage has plenty of room to spread out with a living room, family room and recreation room. Bright, light and airy decor as well as a large deck with gas grill, cooler, beach chairs and a hot and cold running outdoor enclosed shower. This 3 bedroom, 2000 square ft. home has on the first floor: a living room, 1 full and 1 half bath, a queen bed and 2 twin beds, an eat-in kitchen with a large kitchen island, and a family room with flat screen TV. The ground floor has a recreation room with a ping pong table and another flat screen TV with Roku to go along with the queen sleeper sofa, daybed and downstairs bedroom with a queen bed. Red River Beach is just 1.7 miles south of the house with the Rail Trail right down the street only 3/10 mile. Very easy access to Rt 28 or Rt 6. No smoking. Must be over 25 years old to rent. Additional availability info: 1 well behaved dog allowed; Off season 3 day min. Additional pricing info: $300 Pet Security deposit; $100 Pet fee; non refundable $125 booking fee;, State and local taxes of 12.45% will apply. One step to enter home. 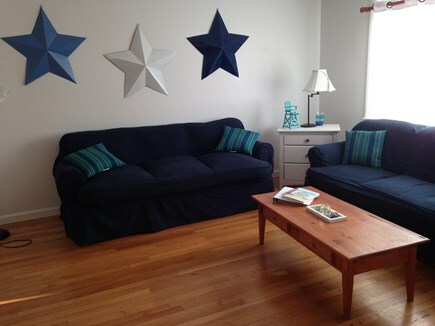 Two bedrooms, kitchen, living room, deck and bathrooms are all on the main floor. We enjoyed this dog friendly, spacious, comfortable home. It offers many amenities like being in your own home. We were two blocks from the bike trail, a mile from Red River Beach, close to Freedom Ferry to Nantucket, restaurants, and all the quaint towns nearby. 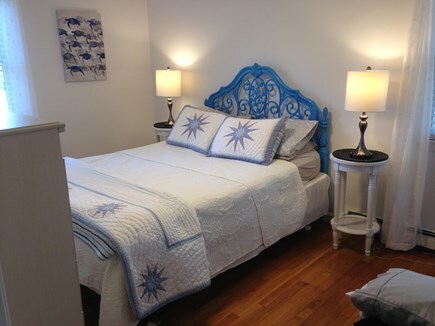 It was a relaxing and lovely location for a memorable Cape Cod vacation. 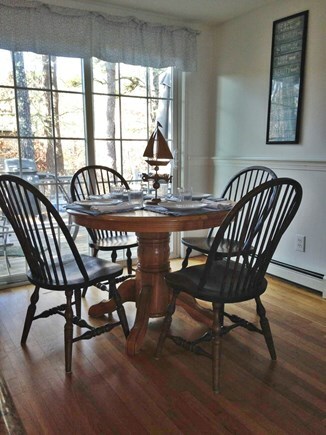 Thank you for sharing your beautiful Harwich home with us! This was our first trip to the Cape and the location of your house was perfect. We enjoyed the proximity of the bike trail and the beach! The house itself was very clean, comfortable and very spacious. The outdoor shower was awesome! We especially appreciated that we could bring our dog on vacation with us. He enjoyed the house and Cape area as well! We'll be back!! I appreciate your positive feedback about our home. So glad you had a wonderful time on the Cape. Looking forward towards having you and your family back next year. This was our 2nd time staying here. The house is spacious and has everything you would need. We loved the fact that we could bring our dog as well. The beach is right down the street which was convenient. We had a great time and will be returning. Thank you for taking the time to review your stay with us. So happy that you enjoyed your stay and I’m looking forward to having you and your family again as our guests next year. Thank you for sharing your lovely home with us his week! It was just perfect for my husband and I and our mini-dachshund Kaylie. The location is perfect for getting to Red River Beach and all around the island. We loved all your personal touches in the house and loved especially how clean it was. And of course we loved being able to have our dog on vacation with us! We hope to see you again next summer. Thank you for sharing your Cape house with us this week. we had a wonderful time! Location is great! Loved the bike path, beach and shops. Your home is comfortable and roomy! we especially loved being able to bring our dog Monty with us! hopefully, we will be back again next summer. your home is lovely! We had a wonderful week with our daughters and look forward to returning next summer with our dog Rosie. We know she'll enjoy your home as much as we did. Thanks for welcoming us to your home in harwich. Our family enjoyed our stay and look forward to coming back to harwich again. Thank you for allowing us to stay in your home. We had a wonderful time. We loved being able to have our dog Rosie with us while on vacation. We look forward toward coming back! We enjoyed our stay an look forward to coming back! The house was close to everything and had everything we needed. There is just something magical about the Cape that drew our family to vacation there for over 15 years. We live near the quiet area of the New Jersey shore with our two sons and an energetic mini Australian Shepherd. Boarding our dog was expensive and it felt like we left a member of our family behind. So we knew when we started to offer our home as a summer rental this year, we would include your four legged family member. It was our dream fulfilled this year to own a little part of the Cape and we are excited to share it with you and your family. The cottage surprises you. Inside is an abundance of space for your family. One big open room with an updated eat in kitchen with island seating, living room and big deck. 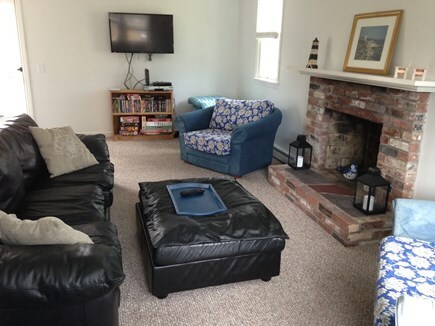 Off the kitchen is a large family room and downstairs more space with a recreation room. The best part is the location. The bike trail and Red River Beach is only down the road.